While viewing the young brown dwarf ISO-Oph 102, an international team of astronomers pinpointed carbon monoxide gas around the brown dwarf and found that the outer region of the dusty disc encircling the brown dwarf contains millimeter-sized solid grains. 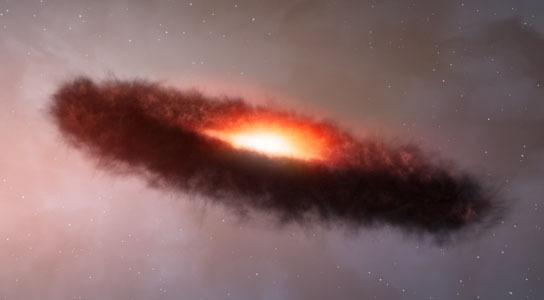 Astronomers using the Atacama Large Millimeter/submillimeter Array (ALMA) have for the first time found that the outer region of a dusty disc encircling a brown dwarf contains millimeter-sized solid grains like those found in denser discs around newborn stars. The surprising finding challenges theories of how rocky, Earth-scale planets form, and suggests that rocky planets may be even more common in the Universe than expected. The research paper (PDF) is printed in the Astrophysical Journal Letters. 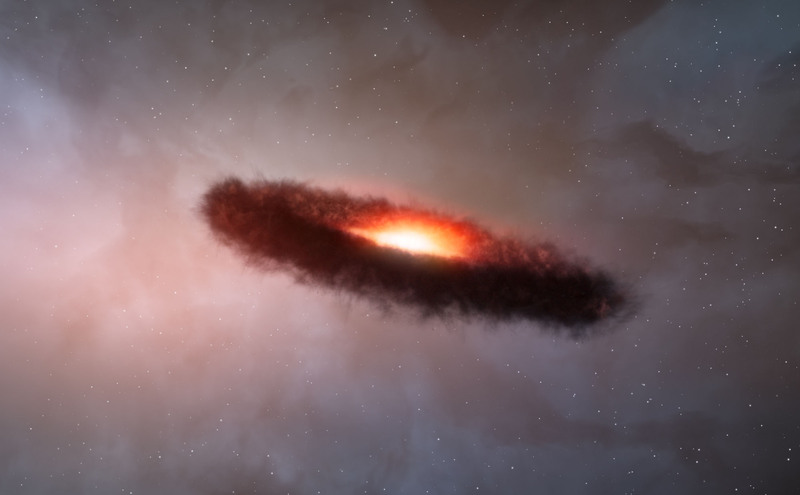 “We were completely surprised to find millimeter-sized grains in this thin little disc,” said Luca Ricci of the California Institute of Technology, USA, who led a team of astronomers based in the United States, Europe and Chile. “Solid grains of that size shouldn’t be able to form in the cold outer regions of a disc around a brown dwarf, but it appears that they do. We can’t be sure if a whole rocky planet could develop there, or already has, but we’re seeing the first steps, so we’re going to have to change our assumptions about conditions required for solids to grow,” he said. ALMA’s increased resolution compared to previous telescopes also allowed the team to pinpoint carbon monoxide gas around the brown dwarf — the first time that cold molecular gas has been detected in such a disc. This discovery, and that of the millimeter-size grains, suggest that the disc is much more similar to the ones around young stars than previously expected. Ricci and his colleagues made their finding using the partially completed ALMA telescope in the high-altitude Chilean desert. ALMA is a growing collection of high precision, dish-shaped antennas that work together as one large telescope to observe the Universe with groundbreaking detail and sensitivity. ALMA “sees” the Universe in millimeter-wavelength light, which is invisible to human eyes. Construction of ALMA is scheduled to finish in 2013, but astronomers began observing with a partial array of ALMA dishes in 2011. The astronomers pointed ALMA at the young brown dwarf ISO-Oph 102, also known as Rho-Oph 102, in the Rho Ophiuchi star-forming region in the constellation of Ophiuchus (The Serpent Bearer). With about 60 times the mass of Jupiter but only 0.06 times that of the Sun, the brown dwarf has too little mass to ignite the thermonuclear reactions by which ordinary stars shine. However, it emits heat released by its slow gravitational contraction and shines with a reddish color, albeit much less brightly than a star. ALMA collected light with wavelengths around a millimeter, emitted by disc material warmed by the brown dwarf. The grains in the disc do not emit much radiation at wavelengths longer than their own size, so a characteristic drop-off in the brightness can be measured at longer wavelengths. ALMA is an ideal instrument for measuring this drop-off and thus for sizing up the grains. The astronomers compared the brightness of the disc at wavelengths of 0.89 mm and 3.2 mm. The drop-off in brightness from 0.89 mm to 3.2 mm was not as steep as expected, showing that at least some of the grains are a millimeter or more in size. 1 Comment on "New Finding Challenges Theories of How Rocky, Earth-Scale Planets Form"
SCIENCE SHOWS THAT THE UNIVERSE CANNOT BE ETERNAL because it could not have sustained itself eternally due to the law of entropy (increasing energy decay, even in an open system). Einstein showed that space, matter, and time all are physical and all had a beginning. Space even produces particles because it’s actually something, not nothing. Even time had a beginning! Time is not eternal. Popular atheistic scientist Stephen Hawking admits that the universe came from nothing but he believes that nothing became something by a natural process yet to be discovered. That’s not rational thinking at all, and it also would be making the effect greater than its cause to say that nothing created something. The beginning had to be of supernatural origin because natural laws and processes do not have the ability to bring something into existence from nothing. What about the Higgs boson (the so-called “God Particle”)? The Higgs boson does not create mass from nothing, but rather it converts energy into mass. Einstein showed that all matter is some form of energy.